As New Yorkers still struggle without power in the wake of Hurricane Sandy, it plunges us right into the heart of a discussion about the historic waterfront. Under Mayor Michael Bloomberg’s Vision for the 21st Century, proclaimed in 2002, the crumbling infrastructure along the Manhattan and Brooklyn waterfront that once served the port of New York should be harnessed for a variety of development schemes. Keen on sustainability, much of this development features healthy recreation, waterfront access, trees and plantings carefully chosen for their species and green effects, historic ships at anchor, restoration of some piers, historic river appreciation with get-downs that include a transparent wall to view river species, and last but not least, some dog parks to put frolicsome fauna back with the flora. 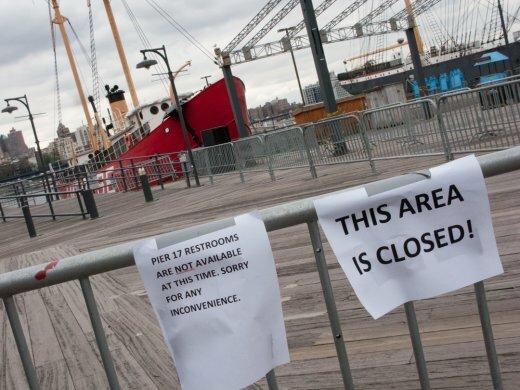 The Brooklyn Bridge Park Conservancy has redeveloped several piers into very popular parks which have become heavily used, and included a recent preservation agreement to restore the Tobacco Warehouse and the Empire Stores. The state has poured money into these endeavors in the Hudson River Trust, long before Bloomberg began his long reign, and Lower Manhattan Development Corporation, transportation funds, Port Authority, 9/11 Recovery money, WTC insurance money and private philanthropy have supplied large stacks of coin, too. But the Hurricane Sandy storm surge drowned the handsome, recently opened expanse of the East River Esplanade from Wall Street to Maiden Lane, warping its laptop rail and twisting its bar stools off their bases. The raging forces that swelled over the tip of the Island from the backwash of the Long Island Sound’s estuary we call the &#8220East River&#8221 may put these infrastructure projects in a completely different light. The sustainable vision of a green city with people swarming to open spaces along shores, from their concentrated, low carbon footprint luxury dwellings in high rises further may succumb to the climate change that is turning shorelines into underwater areas faster than many imagined. To historians, it is ironic that some aspects of the disaster that is afflicting the area right now stems partially from efforts to prevent damage that occurred in the wake of the Blizzard of 1888. In March of that year a three-day storm dumped an unseasonal 21 inches on the city, paralyzing transportation, closing shops, felling wires and forcing citizens to endure subzero temperatures with little power and food for days. The Edison Company, predecessor to ConEd managed to keep supplying some power. A lone bakery Fleishmann’s that remained open on Lower Broadway was mobbed. One jokester put a &#8220do not walk on the grass&#8221 sign on top of a huge snow pile. The public reaction included, after long resistance and further discussion, approval of a new subway system in 1894. Also, the city government determined that the tangle of wires along streets was too vulnerable to weather and put them underground, where this week the switches drowned when the water poured through underground tunnels.. The old Con Edison Power Plant at 14th Street blew a major transformer on Monday, the reason much of Lower Manhattan on the East Side is still dark five days after Sandy. The image from the Museum of the City of New York shows snowdrifts at Fifth Avenue a few blocks further west in 1888, on West 14th Street. 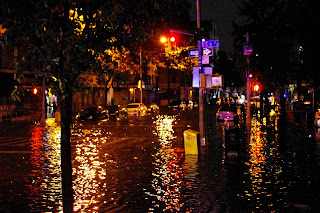 Having invested in shoreline salvage and restoration, NYC is now in the unenviable position of wondering whether to pull back entirely, in light of the possibility that the combination of fierce weather generated over warmer waters and rising water sea levels from melting glaciers and arctic cap may offer frequent encores of the Sandy Superstorm. This September, the arctic cap was reported to have receded to historic levels. While historic sites in New York are mostly reporting resources intact, there are reports of damage around the boroughs such as John Jacob Astor’s obelisk which was shattered in the Trinity Uptown cemetery at 155th by a fallen tree, and the copper roof of the Mount Morris Fire Tower on the acropolis in Marcus Garvey Park, blown off into a crumpled heap. Photos: Above, Con Edison at work at the East River on Nov. 2, 2012- middle, a redesigned waterfront- below, the West 14th Street during the Blizzard of 1888 (Courtesy the Museum of the City of NY). Karmic consequences from the mindless capitalism of the gilded age, carried forward through three major international war periods and multiple economic disasters right to the heart of the Romney campaign today: that John Jacob Astor’s obelisk was shattered as part of Sandy’s fury. And the spiritual descendants of those same capitalists resist the measures, right now, that would begin to address the issues of climate change. Sorry for the “self edit” of my comment, above. These people were hardly “mindless”, they were (and are) very determinedly rapacious. Restoring the historic oyster reefs around Manhattan and to the South would dramatically reduce the surge that will return in future storms. 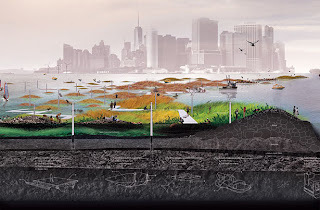 Take a look at a design proposal at http://www.hudsonriver.org/orrp.html and the oysters would help clean the waters as the organism is a filter feeder with an enormous appetite.